Editor's introduction; Part I. The First Draft of the Introduction: 1. The first draft of the introduction; Part II. 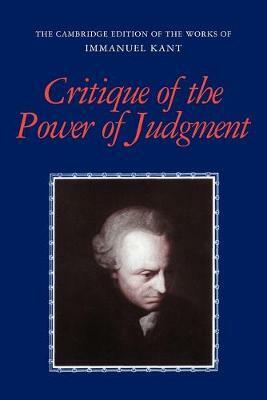 Critique of the Power of Judgment: 2. Preface; 3. Introduction; Part III. First Part: Critique of the Aesthetic Power of Judgment: 4. First section, first book: analytic of the beautiful; 5. First section, second book: analytic of the sublime; 6. Deduction of pure aesthetic judgments; 7. Second section: the dialectic of the aesthetic power of judgment; 8. Appendix: on the methodology of taste; Part IV. Second Part: Critique of the Teleological Power of Judgment: 9. First division: analytic of the teleological power of judgment; 10. Second division: dialectic of the teleological power of judgment; 11. Appendix: methodology of the teleological power of judgment.